World’s first leading manufacturers of high-frequency power tools, FEIN power tools which operate with an increased network frequency (300Hz). FEIN has been producing durable, powerful and usage-focused grinders for industry and manual trades since 1953. The FEIN quality you would expect of a product made in Germany and more than 50 years of experience in developing and producing high-frequency power tools guarantees absolute reliability and a superior service life for industrial continuous use under the toughest conditions. Compared with pneumatic tools and also power tools with a universal motor, their design brings them a number of benefits which deliver huge potential for cutting costs and therefore makes them the most sensible choice in many areas of metalwork. The superior tool concept of FEIN high-frequency power tools makes them particularly well suited to use in metalwork, for heavy-duty grinding and continuous use when roughing-down or cutting under the toughest working conditions. From small compact angle grinders to extremely powerful and large angle grinders and a wide range of straight grinders the FEIN high-frequency range satisfies your every grinding need. Higher frequency is generated by a frequency converter. World’s first leading manufacturers of high-frequency power tools, FEIN high-frequency power tools satisfy very high robustness and Service life requirements for heavy duty grinding. From large angle grinders and a wide range of straight grinders, the FEIN high-frequency range satisfies your every grinding need for heavy duty applications. The FEIN quality you would expect of a product made in Germany and more than 50 years of experience in developing and producing high-frequency power tools guarantees absolute reliability and a superior service life for industrial continuous use under the toughest conditions. By increasing the frequency from 50 Hz to 300 Hz, the power increases yet FEIN high-frequency power tools are retaining the same size and weight. The optimum power/weight ratio is reached at 300 Hz. Outstanding speed stability over the entire load range ensures optimum peripheral speeds which impacts positively on grinding performance, productivity and an appreciable reduction in grinding disc wear. 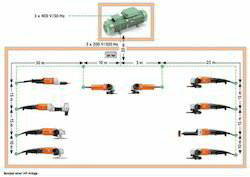 The power distribution system for high-frequency power tools has virtually no energy losses, while with pneumatic systems the heat produced when compressing air results in greater energy losses. If you’re looking for an introduction to high frequency, you can choose from two single-station converters: HFS 17-300 or HFS 27-300. 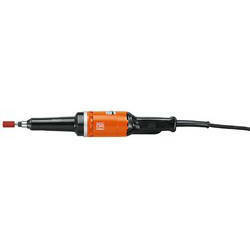 They make industrial high-frequency grinding with FEIN easy, cost-effective and mobile for everyone. Benefit from the advantages of high-frequency technology for all types of industrial grinding work with the new FEIN single-station converters. 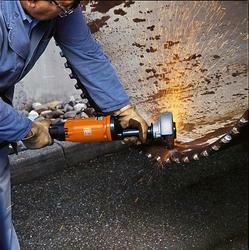 FEIN provides powerful high-frequency angle grinder for heavy-duty cutting, grinding work. Metal motor and gearbox housing for maximum load capacity in industrial continuous use. Fully encapsulated motor, 100% dust protection with surface cooling for maximum stability and service life even under extreme conditions of use. Maximum reliability and outstanding service life. World’s first leading manufacturers of high-frequency power tools, FEIN power tools which operate with an increased network frequency (300Hz). FEIN has been producing durable, powerful and usage-focused high-frequency polishers for industry and manual trades since 1953. The FEIN quality you would expect of a product made in Germany and more than 50 years of experience in developing and producing high-frequency power tools guarantees absolute reliability and a superior service life for industrial continuous use under the toughest conditions.FEIN high-frequency motors are surface-ventilated and thus completely protected from dust. The most powerful FEIN HF polishers give you a quality satin finishing work with pin tools. Fully encapsulated motor, 100% dust protection with surface cooling for maximum stability and service life even under extreme conditions of use. FEIN high-frequency polishers provide you a high resolution without substantial loss of the workpiece. The process is utilized to remove an unwanted layer (or) burrs from the workpiece surface. Ideal power/weight ratio and excellent efficiency. We are the leading and prominent Manufacturer, Exporter and Distributor of Fein Heavy Duty Grinding Machine HFS 17-300. World’s first leading manufacturers of high-frequency power tools, FEIN Handy high-frequency compact angle grinder for light-duty grinding and deburring work. FEIN has been producing durable, powerful and usage-focused grinders for industry and manual trades since 1953. Modern high-frequency power tools usually operate at a frequency of 300 Hz. 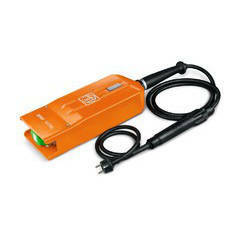 FEIN high-frequency power tools are also designed for maximum load capacity and with minimum maintenance in mind. This results in longer service lives, shorter downtimes, and reduced maintenance and repairs. The FEIN quality you would expect of a product made in Germany and more than 50 years of experience in developing and producing high-frequency power tools guarantees absolute reliability and a superior service life for industrial continuous use under the toughest conditions. From small compact angle grinders to extremely powerful and large angle grinders and a wide range of straight grinders the FEIN high-frequency range satisfies your every grinding need. Compared with pneumatic tools and also power tools with a universal motor, their design brings them a number of benefits which deliver the huge potential for cutting costs and therefore makes them the most sensible choice in many areas of metalwork. The FEIN quality you would expect of a product made in Germany and more than 50 years of experience in developing and producing high-frequency power tools guarantees absolute reliability and a superior service life for industrial continuous use under the toughest conditions. 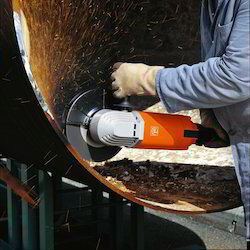 · Highly efficient compact angle grinder with the highest grinding capacity on the market. · Dust-proof fully encapsulated switch for maximum service life. · Very thick-walled metal gearbox head made from cast aluminum for maximum stability and service life. · Perfect ergonomics with 2 handle zones and the smallest handle size for optimum handling even in continuous use. · Powerful ventilation for effective motor ventilation. · Air escapes to the bottom. World’s first leading manufacturers of high-frequency power tools ,FEIN high-frequency angle grinder for medium - to heavy-duty cutting, grinding and brushing works. The superior tool concept of FEIN high-frequency power tools makes them particularly well suited to use in metalwork, for heavy-duty grinding and continuous use when roughing-down or cutting under the toughest working conditions. 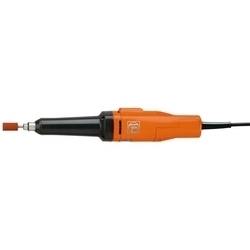 FEIN high-frequency power tools satisfy very high robustness and service life requirements. They have power reserves, on average a good 100 % higher than normal. In everyday use, this translates into constant speed across the entire load range. For efficient working with a high grinding performance and lower levels of disc wear. The FEIN high-frequency range includes a wide selection of angle grinders and straight grinders for trades people and professional users in industry. The FEIN quality you would expect of a product made in Germany and more than 50 years of experience in developing and producing high-frequency power tools guarantees absolute reliability and a superior service life for industrial continuous use under the toughest conditions. 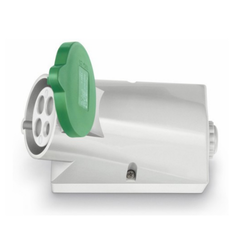 · Metal motor and gearbox housing for maximum load capacity in industrial continuous use. · Fully encapsulated motor, 100% dust protection with surface cooling for maximum stability and service life even under extreme conditions of use. · Maximum reliability and outstanding service life. World’s first leading manufacturers of high-frequency power tools, FEIN brings you a new dimensional handy, lightweight high-frequency straight grinder for milling works with maximum load capacity. FEIN high-frequency motors are surface-ventilated and thus completely protected from dust. Constant motor speed due to the three-phase motor, Only 3-5 % speed drop under nominal load, No performance loss - not even after many operating hours and Up to 2.5 times overload capacity of the power tools. In case of a fault, the maximum voltage occurring against earth is only 0.58 of the rated voltage. With a rated voltage of 200 V at 300 Hz, for example, that is only 116 V. Only 3-5 % speed drop under nominal load, Fault current safety switches (FI safety switches) and Isolating transformers (e.g. in closed containers, if obligatory). In various performance classes and for tough continuous use, for example in foundries, steel or shipbuilding. From small compact angle grinders to extremely powerful and large angle grinders and a wide range of straight grinders the FEIN high-frequency range satisfies your every grinding need. · Extremely handy for universal use. · Split grinding spindle with multiple mountings for absolutely precise and vibration-free concentricity. FEIN, World’s first leading manufacturers of high-frequency power tools.A higher frequency means a higher speed which increases the motor’s output power. Increasing the frequency from 50 Hz to 300 Hz, therefore, increasing power six fold while retaining the same size and weight. The optimum power/weight ratio is reached at 300 Hz. Outstanding speed stability over the entire load range ensures optimum peripheral speeds which impacts positively on grinding performance, productivity and an appreciable reduction in grinding disc wear. The induction motors of the high-frequency power tools with squirrel cage rotors feature no wearing power-transmitting parts. They don’t need powerful ventilation, just surface ventilation, which allows them to be fully encapsulated and gives the motors complete dust protection. High-frequency tools have simple structures, making them easy, fast and cheap to maintain. Stationary frequency converters require virtually no service – with the exception of ball bearing maintenance (roughly every 20,000 operating hours). The frequency converters required for this, which bring the power up to the higher frequency, are connected to the national three-phase grid. There are also many benefits to using high-frequency power tools in an industrial setting. The productivity increase is extremely noticeable, thanks to the increased power, ideal speeds, constant speed stability even under load and the associated very high grinding performance. Tool wear is minimized. FEIN high-frequency power tools are also designed for maximum load capacity and with minimum maintenance in mind. This results in longer service lives, shorter downtimes, and reduced maintenance and repairs. In industrial continuous use, for example in multi-shift operation, choosing FEIN high-frequency technology also delivers better cost-effectiveness. Different power classes available (up to 45 kVA). 200 V / 300 Hz. We are the leading and prominent Manufacturer, Exporter and Importer of Msho 852-1 Fein Straight Grinder. With the help of our skilled professionals, we are highly engaged in presenting an excellent range of Assembly Socket to our esteemed customers. Our offered product is manufactured under the direction of skilled professionals as per the requirements of our customers. Assembly Socket is extensively used in Component-Based Development (CBD) to describe systems and for small pipe diameters. Our products are easy to use. World’s first leading manufacturers of high-frequency power tools ,FEIN grinders with high frequency range satisfy you’re every grinding need, directly driven by a heavy duty drive (3 phase). If several workstations have to be fitted into a given space, we would recommend a permanent installation with one larger frequency converter and permanent cables. If you’re looking for an introduction to high frequency, you can choose from two single-station converters: HFS 17-300 or HFS 27-300. 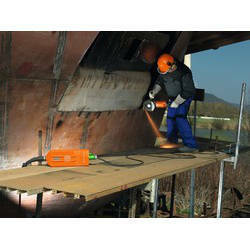 They make industrial high-frequency grinding with FEIN easy, cost-effective and mobile for everyone. They enable the use of individual high-frequency grinders in continuous use where stationary high-frequency solutions are uneconomical or unfeasible Benefit from the advantages of high frequency technology for all types of industrial grinding work with the new FEIN single-station converters. The power distribution system for high-frequency power tools has virtually no energy losses, while with pneumatic systems the heat produced when compressing air results in greater energy losses. In reality, an additional 10 to 20 % more energy is needed due to leaks – if the systems are poorly maintained, this figure may even rise to 30% and above. The performance of the pneumatic motors also depends on the condition of their components, which are subject to wear (for example, cylinder, rotor, thrust washers, flaps). · 10% more material removal, i.e. greater work productivity. World’s first leading manufacturers of high-frequency power tools, FEIN high-frequency die grinders are perfectly adapted to brushing and milling works, specifically in places that are difficult to reach. 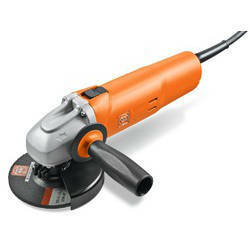 FEIN high frequency die grinders are Handy for light-duty grinding work. Split grinding spindle with multiple mountings for absolutely precise and vibration-free concentricity. FEIN Metal motor and gearbox housing setup withstand maximum load capacity in industrial continuous use with effective motor cooling. We manufacture die grinders with maximum reliability and outstanding service life resulting with effective output with greater speed consistency. The FEIN quality you would expect of a product made in Germany and more than 50 years of experience in developing and producing high-frequency power tools guarantees absolute reliability and a superior service life for industrial continuous use under the toughest conditions. In industrial continuous use, for example in multi-shift operation, choosing FEIN high-frequency technology also delivers better cost-effectiveness. FEIN high-frequency power tools can also be used as portable devices on the construction site or on stationary grinding stations. · Ideal power/weight ratio and excellent efficiency. World’s first leading manufacturers of high-frequency power tools, FEIN has been producing durable, powerful and usage-focused grinders for industry and manual trades since 1953. 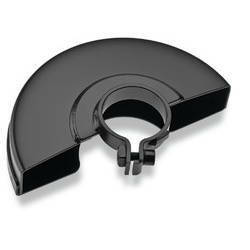 In various performance classes and for tough continuous use, for example in foundries, steel or shipbuilding. Modern high-frequency power tools usually operate at a frequency of 300 Hz. FEIN high-frequency power tools are also designed for maximum load capacity and with minimum maintenance in mind. This results in longer service lives, shorter downtimes and reduced maintenance and repairs. The FEIN quality you would expect of a product made in Germany and more than 50 years of experience in developing and producing high-frequency power tools guarantees absolute reliability and a superior service life for industrial continuous use under the toughest conditions. From small compact angle grinders to extremely powerful and large angle grinders and a wide range of straight grinders the FEIN high-frequency range satisfies your every grinding need. Compared with pneumatic tools and also power tools with a universal motor, their design brings them a number of benefits which deliver huge potential for cutting costs and therefore makes them the most sensible choice in many areas of metalwork. The FEIN quality you would expect of a product made in Germany and more than 50 years of experience in developing and producing high-frequency power tools guarantees absolute reliability and a superior service life for industrial continuous use under the toughest conditions. Simple installation, Robustness, Reliability, Insignificant speed drop at nominal load (3 - 6 %), Short-term overload capacity (approx. 2.5 times) up to the breakdown torque = standstill of the machine, Extremely favourable power-weight ratio, Machines and motors for absolute continuous operation, Higher efficiency compared to normal frequency and compressed air,Considerable cost advantage compared to compressed air. 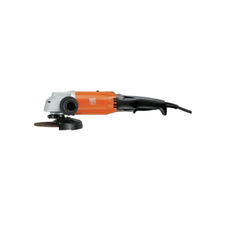 World’s first leading manufacturers of high-frequency power tools , FEIN Long-neck high-frequency angle grinder for hard-to-reach places with maximum reliability. Modern high-frequency power tools usually operate at a frequency of 300 Hz. 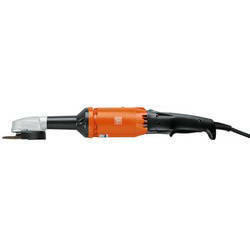 FEIN high-frequency power tools are also designed for maximum load capacity and with minimum maintenance in mind. This results in longer service lives, shorter downtimes and reduced maintenance and repairs. The FEIN quality you would expect of a product made in Germany and more than 50 years of experience in developing and producing high-frequency power tools guarantees absolute reliability and a superior service life for industrial continuous use under the toughest conditions. From small compact angle grinders to extremely powerful and large angle grinders and a wide range of straight grinders the FEIN high-frequency range satisfies your every grinding need. Compared with pneumatic tools and also power tools with a universal motor, their design brings them a number of benefits which deliver huge potential for cutting costs and therefore makes them the most sensible choice in many areas of metalwork. The FEIN quality you would expect of a product made in Germany and more than 50 years of experience in developing and producing high-frequency power tools guarantees absolute reliability and a superior service life for industrial continuous use under the toughest conditions. · Low profile gearbox head 65 mm in height, including grinding disc. World’s first leading manufacturers of high-frequency power tools ,FEIN provides you an extremely handy high frequency grinder from light to heavy duty grinding with fully encapsulated motor, 100% dust protection with surface cooling for maximum stability and service life even under extreme conditions of use. We manufacture Lightweight and handy high-frequency straight grinder for comfortable usage especially for milling works. We suggest powerful high-frequency straight grinder for medium-duty grinding work with pin tools. There are also many benefits to using high-frequency power tools in an industrial setting. The productivity increase is extremely noticeable, thanks to the increased power, ideal speeds, constant speed stability even under load and the associated very high grinding performance. Tool wear is minimised. FEIN high-frequency power tools are also designed for maximum load capacity and with minimum maintenance in mind. This results in longer service lives, shorter downtimes and reduced maintenance and repairs. In industrial continuous use, for example in multi-shift operation, choosing FEIN high-frequency technology also delivers better cost-effectiveness. 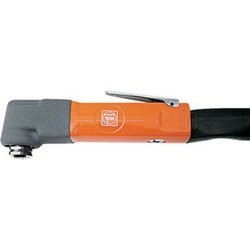 FEIN, World’s first leading manufacturers of high-frequency power tools .Can be used anywhere provided there is a 230 V grid, no installation required. It is easy to transport, flexible in use. If you’re looking for an introduction to high frequency, you can choose from two single-station converters: HFS 17-300 or HFS 27-300. 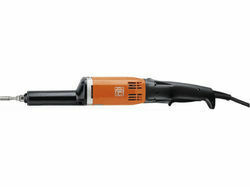 They make industrial high-frequency grinding with FEIN easy, cost-effective and mobile for everyone. They enable the use of individual high-frequency grinders in continuous use where stationary high-frequency solutions are uneconomical or unfeasible. Location like construction sites, but also in small foundries, shipbuilding plants, steelworks and boiler and tank construction facilities. Benefit from the advantages of high frequency technology for all types of industrial grinding work with the new FEIN single-station converters. Features of high frequency: Simple installation, Robustness, Reliability, Insignificant speed drop at nominal load (3 - 6 %), Short-term overload capacity (approx. 2.5 times) up to the breakdown torque = standstill of the machine, Extremely favourable power-weight ratio, Machines and motors for absolute continuous operation, Higher efficiency compared to normal frequency and compressed air, Considerable cost advantage compared to compressed air. 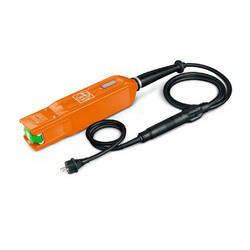 · Can be used anywhere provided there is a 230 V grid. · Pays for it quickly and offers clear investment costs. · Easy to transport, flexible in use. · Robust housing, sealed construction elements. FEIN, World’s first leading manufacturers of high-frequency power tools .The cost of purchasing a FEIN high-frequency tool with single-station converter will be paid off in just one year. 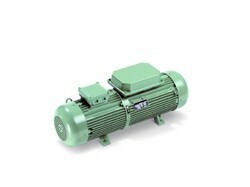 A higher frequency means a higher speed which increases the motor’s output power. Increasing the frequency from 50 Hz to 300 Hz therefore increasing power six fold while retaining the same size and weight. The optimum power/weight ratio is reached at 300 Hz. Outstanding speed stability over the entire load range ensures optimum peripheral speeds which impacts positively on grinding performance, productivity and an appreciable reduction in grinding disc wear. The induction motors of the high-frequency power tools with squirrel cage rotors feature no wearing power-transmitting parts. They don’t need powerful ventilation, just surface ventilation, which allows them to be fully encapsulated and gives the motors complete dust protection. High-frequency tools have simple structures, making them easy, fast and cheap to maintain. Stationary frequency converters require virtually no service – with the exception of ball bearing maintenance (roughly every 20,000 operating hours).Investing in a high-frequency system from FEIN will pay off very quickly. If you’re looking for an introduction to high frequency, you can choose from two single-station converters: HFS 17-300 or HFS 27-300. They make industrial high-frequency grinding with FEIN easy, cost-effective and mobile for everyone. They enable the use of individual high-frequency grinders in continuous use where stationary high-frequency solutions are uneconomical or unfeasible. Location like construction sites, but also in small foundries, shipbuilding plants, steelworks and boiler and tank construction facilities. Benefit from the advantages of high frequency technology for all types of industrial grinding work with the new FEIN single-station converters. FEIN, World’s first leading manufacturers of high-frequency power tools .A higher frequency means a higher speed which increases the motor’s output power. Increasing the frequency from 50 Hz to 300 Hz therefore increasing power six fold while retaining the same size and weight. The optimum power/weight ratio is reached at 300 Hz. Outstanding speed stability over the entire load range ensures optimum peripheral speeds which impacts positively on grinding performance, productivity and an appreciable reduction in grinding disc wear. 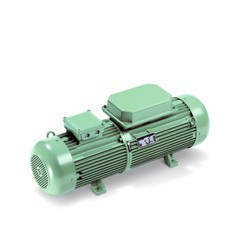 The induction motors of the high-frequency power tools with squirrel cage rotors feature no wearing power-transmitting parts. They don’t need powerful ventilation, just surface ventilation, which allows them to be fully encapsulated and gives the motors complete dust protection. High-frequency tools have simple structures, making them easy, fast and cheap to maintain. Stationary frequency converters require virtually no service power, ideal speeds, constant speed stability even under load and the associated very high grinding performance. Tool wear is minimized. FEIN high-frequency power tools are also desig– with the exception of ball bearing maintenance (roughly every 20,000 operating hours). The frequency converters required for this, which bring the power up to the higher frequency, are connected to the national three-phase grid. There are also many benefits to using high-frequency power tools in an industrial setting. The productivity increase is extremely noticeable, thanks to the increased ned for maximum load capacity and with minimum maintenance in mind. This results in longer service lives, shorter downtimes and reduced maintenance and repairs. In industrial continuous use, for example in multi-shift operation, choosing FEIN high-frequency technology also delivers better cost-effectiveness. 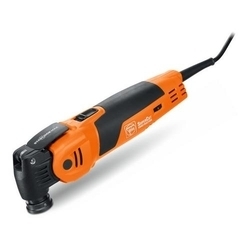 FEIN, World’s first leading manufacturers of high-frequency power tools .Can be used anywhere provided there is a 230 V grid, no installation required. It is easy to transport, flexible in use. If you’re looking for an introduction to high frequency, you can choose from two single-station converters: HFS 17-300 or HFS 27-300. They make industrial high-frequency grinding with FEIN easy, cost-effective and mobile for everyone. They enable the use of individual high-frequency grinders in continuous use where stationary high-frequency solutions are uneconomical or unfeasible. Location like construction sites, but also in small foundries, shipbuilding plants, steelworks and boiler and tank construction facilities. Benefit from the advantages of high frequency technology for all types of industrial grinding work with the new FEIN single-station converters. Features of high frequency: Simple installation, Robustness, Reliability, Insignificant speed drop at nominal load (3 - 6 %), Short-term overload capacity (approx. 2.5 times) up to the breakdown torque = standstill of the machine, Extremely favourable power-weight ratio, Machines and motors for absolute continuous operation, Higher efficiency compared to normal frequency and compressed air, Considerable cost advantage compared to compressed air. Looking for High frequency power tools ?